After racking up rave reviews abroad, he returned to his roots and his flagship restaurant Reuben's currently finds its home in Franschhoek. In 2009, Riffel opened his second Reuben's at a boutique country hotel in the Robertson wine valley, and shortly thereafter the third Reuben's was opened at the V&A Waterfront in Cape Town. His awards list includes that of Chef of the Year and Restaurant of the Year in the Eat Out awards of 2004, and Reuben's in Franschhoek was ranked in South Africa's Top 10 restaurants for three consecutive years. In addition to his successful restaurant portfolio, Reuben has also published three best-selling cookbooks. In June 2012 he was a guest judge on the second season of the M-Net reality competition MasterChef South Africa, in which he did battle against contestant Khaya Silingile in the Cook-Off Challenge, preparing seafood fricassée with scallops, hake, potato gnocchi and a seaweed butter sauce. 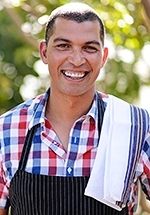 In 2013 hosted the kykNET cooking programme 5 Sterre met Reuben Riffel (5 Stars with Reuben Riffel), in which he taught viewers how to make five-star dishes from home. In 2014 he replaced Andrew Atkinson as a permanent judge on MasterChef South Africa, beginning with its third season, after Atkinson took up a lucrative job offer that prevented him from returning to the show.